From November 2017 and spread out until May 2018 a series of 6 afternoons of lectures on the topic of integral ecology is offered in cooperation by the pontiﬁcal universities in Rome. 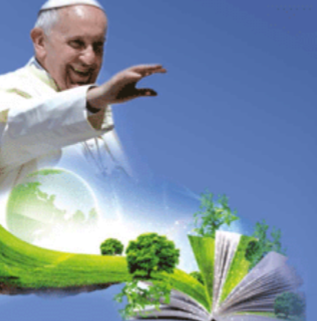 Hopefully you have all read the gripping and very readable encyclical “Laudato si’” of Pope Francis by now. It is often called an environmental encyclical, but it goes much deeper than that and justly has to be classiﬁed as a social encyclical. It deals both with the outcry of our “common home” planet earth and the outcry of the poor and vulnerable population. You are likely to know the predicted consequences of climate change: more extreme weather events, droughts and desertiﬁcation, disappearing of islands and glaciers (the latter often causing water supply problems), ﬂoodings and hurricanes, impact on future harvests – the harvests may improve somewhat in the “developed” countries while a deterioration is likely in developing countries – and ﬁnally migration due to these issues. Climate change is mainly caused by the emission of greenhouse gases like CO2. The 1 billion richest people of our “common home” earth are responsible for 50% of the total greenhouse gas emissions, the next 3 billion for further 45%, and the poorest 3 billion for only 5% because they have no access to affordable fossil fuels. At the same time these poorest 3 billion will suffer from the worst consequences of climate change. This may give you an idea of the immense injustices we are facing on a global scale. Let us now turn to an ethical and theological perspective of the ecological crisis: As Christians we believe that God created the world and in particular the earth with all that it holds. Creation is in a certain sense a sacrament, i.e. a sign and a medium of God’s self-revelation and of his gift of himself. Out of love God has entrusted his creation to humankind whom he created in his own image, but God remains the owner of his creation and we are responsible to him for th way we deal with it. The gift of creation to the care of humankind can be compared in a graphic illustration to a rose that is presented by a young man to his girl-friend: It is a gift out of love. When we imagine the feelings of the lover, when his girl-friend takes the rose out of his hand, throws it to the ground and tramples on it… Of course he would expect her to receive the rose lovingly, care for it and treasure it, because it is a sign of his love. – This may make us think, when we consider how humankind especially in the richer countries has grown into the habit of seeing nature merely as a collection of resources to be exploited, not caring about the harm done to the rest of creation or even to other human beings. The basic root of our maltreatment of creation may be the spreading belief that there is no creator God and the consequent lack of consciousness of sin or of responsibility. Where God is lost, there remains only the “ego”. Sin may be seen as the breaking of a three dimensional relationship: - with God, - with the others, - with creation. The following attempt of a confrontation of the seven cardinal sins with some “ecological sins” (in inverted commas) has made me very thoughtful: the cardinal sin of Pride may be confronted with the negation of God as creator, Greed or Avarice with a deviated anthropocentrism that sees only the self as the centre of everything, Envy may be confronted with pollution and environmental degradation, Gluttony with the greed to have ever more and better things, Sloth or Acedia with the indifference in the face of the hunger in the world which may show itself in the thoughtless throwing away of food. The cardinal sin of Lust may correspond to the inappropriate and insufﬁcient use of the earth, for example the inappropriate cultivation of the soil, not making sufﬁcient use of solar, wind and water power or failing to collect rainwater. The latter two ecological sins are hereby sins of omission.